Four Seasons Resort Chiang Mai has announced the 9th Annual Terry Fox Run for cancer research, taking place on Saturday, 8 October 2005. 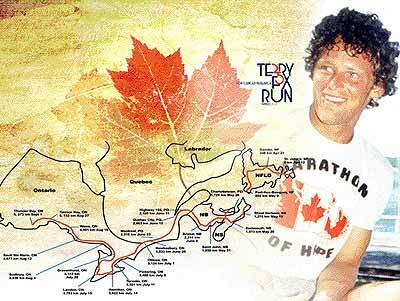 Terry Fox, a young Canadian who lost his leg to cancer, set out to run across Canada to create awareness and raise funds for cancer research world–wide. He ran for 143 consecutive days and completed an average of a 26 mile Marathon distance each day, a heroic act that defies scientific reasoning. Terry changed people’s attitudes towards the disabled and had them derive inspiration from his courage. As cancer claimed his leg at age 21, it didn’t take away his unstoppable spirit. He had fierce determination, which took him to the limit. Picture of Terry Fox on the T-Shirt which everybody will receive. The event will commence at the Chiang Mai 700 Year Anniversary Complex and includes a 10.2 km run or a 2.2 km walk. All levels of athletes (and non-athletes) are welcome to participate. The run is non-competitive, a fun event for the entire family and a good cause to celebrate with schoolmates or colleagues from work. Participants may walk, jump, skate or simply show their support by visiting the event. Registration: 5.30 a.m. to 6.45 a.m. Ticket includes: T-shirt, refreshments and lucky draws after the run/walk. Saturday September 17, was the only fine day for weeks, and coincided with the Chiang Mai Schools Cricket Alliance’s annual September cricket tournament. Eight schools participated with ten teams making it a very busy fun filled day for all. The winners, Chol Patan Pratek. 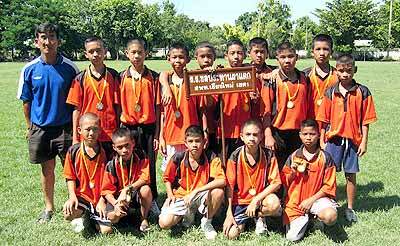 As in previous years, the schools from Doi Saket area proved that they can play cricket well. Chol Pratan Patek in the final proved too strong and disciplined against Prince Royals College (PRC) running out easy winners. In the second final Saimoon batted very aggressively making a huge score that was unattainable for Pa Mai Deng. The star of the day was ‘Gin’ a girl from PRC. She plays with plenty of skill and technique as can be seen in the picture. There are more girls taking to cricket and they are showing that they can play as well as the boys. Schools that participated were Sahagon 2, Montfort (2 teams), PRC, Pa Mai Deng, Pa Pong (two teams), Chol Pratan Pratek, Saimoon, Chieng Doi. Somebody has counted that there are 1,864 curves on the route to be traversed by 300 cars and 200 motorcycles during the rally that will be staged in Mae Hong Son from November 5 to 6. 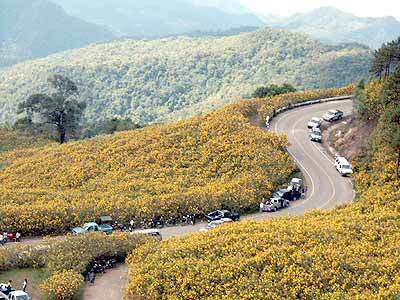 Mexican Sunflower Mountain during winter season in Khun Yuam, Mae Hong Son. Supoj Klinpraneet, president of the Lions Clubs tourism promotion department said that the rally will run on Highway 108 from Chiang Mai past the Mexican Sunflower mountain to Mae Hong Son. Target groups are both Thais and foreigners, with the rally promoting tourism and raising funds for supporting schools and flood victims in Mae Hong Son. Reward for the winner stands at 100,000 baht. Application fees for cars and motorcycles are 4,000 baht and 2,000 baht, including insurance. Those interested can contact 0 4739 7976, 0 1881 1190, 0 9756 8485 and 0 5320 6871. 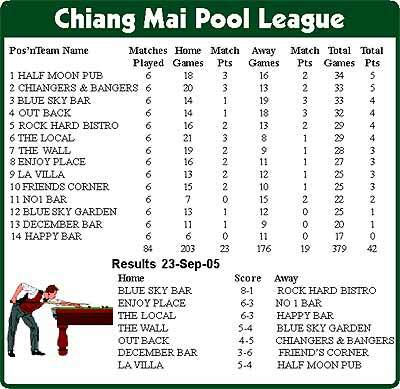 On a day that saw only one team in the top four win in last week’s Chiang Mai Pool League, Chiangers and Bangers took second place outright, Blue Sky Bar moved up to third, Rock Hard Bistro dropped down to fifth and all other positions remained unchanged. The top of the table encounter between Out Back and Chiangers and Bangers lived up to expectations in a thrilling match of mixed fortunes. A reasonable crowd of spectators at Out Back watched the home side shoot into a three game lead, only to see Chiangers reduce the deficit to 2-4 at the break. James lining up a win for Chiangers and Bangers at Out Back. The visitors fought back well to take the match into the final frame and secure victory with only one ball left on the table. League leaders, Half Moon Pub, were involved in an equally exciting affair at La Villa. With Half Moon 2-4 down after the singles, the away side desperately tried to hold onto their unbeaten record by taking the first two doubles. But “The Pizza Boys” held their nerve to run out 5-4 winners. Perhaps the greatest shock of the night came at Blue Sky Bar, who thrashed high flying Rock Hard Bistro 8-1 – sending my favorites down to fifth place in the league, while the home side elevated themselves to third. Elsewhere, glamour girls Joi and Fern put No.1 Bar two up at Enjoy Place. But the boys failed to back them up by losing all their singles and Enjoy finally coasted to a 6-3 win. The Wall maintained their mid table position, beating Blue Sky Garden by the narrowest of margins and a steady Friend’s Corner filed a useful away win at December Bar. With no side remaining unbeaten, all eyes are now focused on Happy Bar, who still await their first win. They gave it all they’d got at The Local and were still concentrating hard at 3-5 down. I believe that all league members will be pleased for Happy once they break their duck, except the side they beat of course. After these crucial results, there’s bound to be some losing players blaming bad luck, one misjudgment or the breeze from an overhead fan. But as far as I’m concerned it was all Michael Phelan’s fault. Apparently, the origins of pool date back to the 15th Century when it was contested outside on the lawn until someone got the idea it might be more comfortable played indoors. 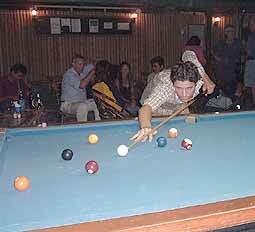 Michael Phelan - the Father of American Billiards (pool) - revolutionized the billiard table and founded the cue. He also promoted the game as a respectable sport and brought it to all classes of society with his publications and Arcadia Billiard Parlor in New York. He didn’t shoot a bad game himself and won the first major stake in American history – US$ 15,000 in 1859.